Here’s a screen shot of what the rather slick Web console looks like as it’s running in a Virtualbox on my Mac at the moment. Proxmox supports KVM and OpenVZ in a single package, and I’m currently interested in running lots of OpenVZ containers from templates which are basically extracted “into” Proxmox and then launched. There are a few settings I need tweaked on a container before I can use it: I have to create a user and provision an SSH key for running Ansible against the containers. One solution would be to extract the content of the template (a compressed tar file), modify its content and repackage, but I supposed it could be done a bit more elegantly, which it can. OpenVZ supports so-called action scripts, which run, say, when a container is started or stopped. This is what I finally came up with. Within talk-to-ct.sh we have to wait a bit until the container is online (i.e. running). I’m omitting that here, but I ought to check with vzctl whether the container status actually is "running". Instead I just wait a bit, hoping that the container will be ready within ten seconds. runs specified shell script in the container. Argument script is a file on the host system which contents is read by vzctl and executed in the context of the container. For a run‐ ning container, the command jumps into the container and executes the script. And what does my run-in-ct script do? It creates a user and sets up an SSH public key so that I can provision the container with Ansible. 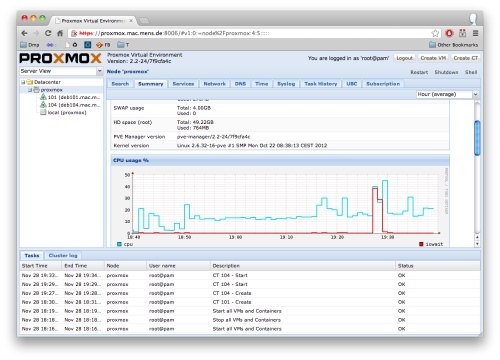 I use Proxmox-VE as a portable data center.